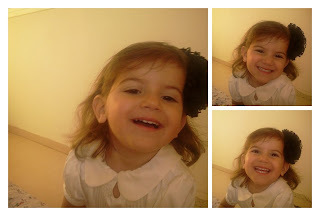 Just wanted to share this little mix of a VERY happy kid getting ready to go to Shul on Rosh Hashana. Ktiva Ichatima Tova to Everybody!!! Beautiful little girl. She sure has changed in the last couple of years. Shana tova to you and your family. A happy, healthy, peaceful year.